Home India Protesters burn Indian Constitution, Abuse Baba Saheb, Delhi Police stands still! NEW DELHI: On August 9, Jantar Mantar saw people yelling anti-reservation slogans and opposing the SC / ST Act and burning the copies of the Indian Constitution. The video of this abuse of the constitution is viral on social media. Surprisingly, all this took place in the presence of Delhi Police. Srinivas Pandey, who was involved in this criminal offence, posted the video on social media, in which he also used inappropriate words for BR Ambedkar. Pandey has said that the constitution of Ambedkar was burnt on Janttar Mantar today by opponents of reservation. According to information received from social media, Srinivas Pandey is a resident of Bhadoi district of Uttar Pradesh. Dalit activist and Ambassador-based activist Debashish JarJaria said that some traitors today burnt the Constitution of India at Jantar Mantar. He has spoken to the SHO of the Parliament’s police station. He has given all the evidence. He assured the proceedings. If no action is taken till tomorrow, we will go ahead and file FIR. 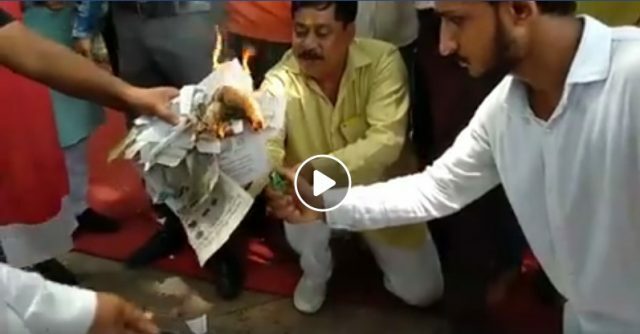 Youth leader and Socialist Ameek Jamei has said that the constitution was burnt in Delhi by the presence of the police, Baba Saheb Ambedkar was abused, right next to the President, the Vice President, the Prime Minister and close to the Parliament on the Jantar Mantar. Previous articleThe Mughal ruled, lived and died in Indian soil, yet they’re labelled as “Thieves”?